Ellisville (population 87) is located in upper-western Illinois about 20 miles northeast of Macomb. The town was founded in 1830 by Levi D. Ellis and currently sits in northwestern Fulton County. County Highway 17 is the main thoroughfare through Ellisville. The Spoon River flows by the east side of town. Ellisville is said to have the smallest operating library in Illinois. More on the town's history can be read at: http://www.iltrails.org/fulton/Twp_Histories/Ellisville.html. A school in Ellisville opened in 1840, and it was called Pleasant Hill Academy. 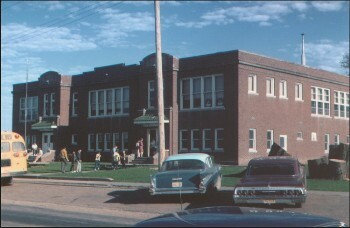 In 1920, a new community high school (pictured above) was established and classes were added one-by-one. Ellisville High School served the town and surrounding farm kids for over four decades, possibly much longer. We believe it was in the late 1940s that consolidation talks began between the small schools of Ellisville, Fairview, and London Mills. We further believe that this effort was realized in the late 1940s when the Spoon River Valley School District was formed. "The Ellisville high school building served as a high school from 1920 to 1949 when the Spoon River Valley School district was formed. 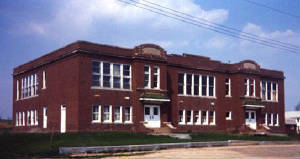 They moved the High School to Fairwiew, IL where it served until 1973. 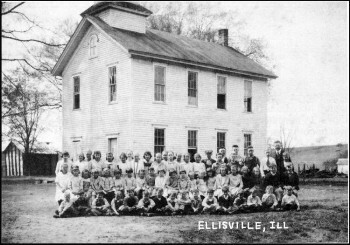 The Ellisville School served as a grade school from 1949 to 1973 when the new schools were built in the country by Rapatee, IL. 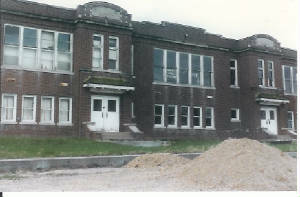 The school was closed in 1973. It was vacant from 1973 to 1987 when it was razed." A new school was built in a country setting near London Mills and the Ellisville school was no longer needed. The Ellisville High School building, sadly, was razed in the late 1980s, after the above photo was taken..
Ellisville HS team nickname: the "Eagles"